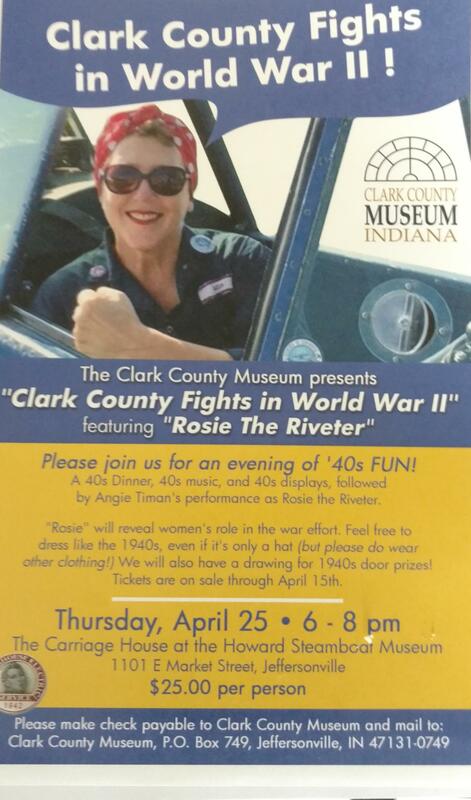 "Clark County Fights in World War II: Rosie the Riveter"
Join us for an evening with Rosie the Riveter, featuring Angie Timan, in a 1940s time warp! 40s music, 40s food by TerriLynn Catering, 40s door prizes, and wartime artifacts from the collections of both museums. You can dress in 40s attire or just wear a 40s hat (additional clothing required!) 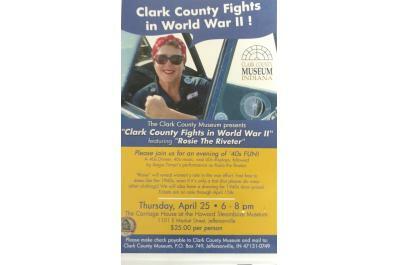 Come celebrate the women, men, and children of Clark County who helped win the war on the home front - truly the Greatest Generation! Price: $25/person checks payable to Clark Co. Museum, Inc., marked "Rosie" to the museum at P. O. Box 749, Jeffersonville, IN 47131-0749. $25/person checks payable to Clark Co. Museum, Inc., marked "Rosie" to the museum at P. O. Box 749, Jeffersonville, IN 47131-0749.